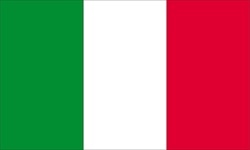 The Italian tricolor flag emerged from the flags used in the new republics set up by the French in northern Italy from 1796 and onwards, in terms of time. Green is said to have been Napolean's very favorite color. Some say that it might have been inspired by the local militia uniforms. The first vertical arrangement was used in 1798 in the so-called Cisalpine Republic. After the actual fall of Napoleon this tricolor was hid from the world for a few decades, till 1848. It was then adopted in several Italian provinces. For more information on this flag consider going to the following page. This page also features different Italian flags for use with modern flagpoles.